The central European region of Galicia (not to be mistaken with with Galicia in Spain) is a historical region, currently divided between Poland and Ukraine and named after the Ukrainian city of Halych. "It seemed like we were in a different country every day!" said two Americans who cycled down the Galicia region. This amazing 8-day tour allows one to immerse oneself in the south-eastern region of Poland,bordering Ukraine. The region was shaped and molded over the centuries by many different cultures. The land where the extremities live alongside one another, in perfect harmony. Both, the architectural wonders of the towns, such as Zamosc town with its marvellous architectural highlights, and the region's virgin landscapes and primeval forests. 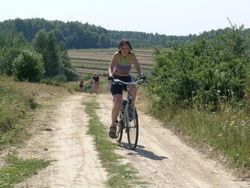 Thanks to the investment put into the Green Velo route project, the previously sandy forest and dirty field roads along the Polish-Ukrainian border has been turned into paved and comfortable, roadsinged paths, offering us this brand new itinerary. Day 1 (Saturday): Krakow - PrzemyslIndividual arrival in Krakow. We meet at the Bird Service office in the old town and travel to collect the bikes at the Bird workshop. Afterwards we leave by bus at 3:00 pm for the town of Przemysl (a historic town on the Polish-Ukrainian border. 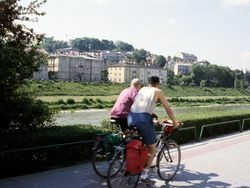 We check in a hotel located next to the new bike bridge , that is part of the Green Velo investment, on the San river.We would advise those unable to book a morning flight or a night train to Krakow to come a day earlier and book an additional night. The first stage of the tour is relatively short. Up until noon, we can take a stroll through Przemysl the second oldest town in southern Poland. This town of historic beauty offers breathtaking churches, a World War I fortress and an overall aura of unexplainable awe.From there, the route passes an arboretum in Bolestraszyce and then through a narrow hanging footbridge once again on the San river and Chotyniec village offering a wooden Eastern Orthodox church. First, we cycle through the sleepy town of Wielkie Oczy, ironically translated as ?Huge Eyes?, that grants us shadowy alleys and multiple places of worship of both, Catholic and Eastern Orthodox origin, as well as an old synagogue. The village is followed by many kilometres of tarmac paths passing through the neighbouring forest. The day concludes with visiting a 16th century Orthodox church in Radruz and a nearby lagoon where we can immerse ourselves in its cool, refreshing waters. We spend the night in the small Roztoczian spa town of Horyniec. We are now in Roztocze, with its pictouresque and narrow stripped fields, considered by many as one of the most spectacular regions in Poland. Where a mosaic of tobacco fields and meadows extends over fertile loess ground. The deep gorges and ravines are also characteristic of this area and, of course, the crystal clear rivers and ponds are just the thing for travellers, just waiting for an opportunity to cool down in the heat of summer.From this day on, apart from the main Green Velo track, we also have have numerous different routes, each deviating in its own manner. A longer visit in the "Szumy nad Tanwią" (The Soughs over Tanew) reservoir where the waters of Roztoczian river shed over the rocky thresholds, is highly recommended. At the end of the day, awaits us a cozy room, in a nice pension, next to a palace. Today's stretch follows the circuitous valley of the delightful Wieprz rivulet. Wieprz means "hog" in Polish and the rivulet is said to meander like the curly tail of the said animal. 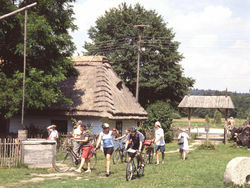 We then ride past water mills that are still functional and stop in the middle of the day at a straw thatched farm in Guciow. We will also visit the heritage museum with its exhibition of ethnographic and geological wonders. Our goal for the day is Zwierzyniec, a little town in the primordial forest of Roztocze National Park, where we will stay for the following two nights. We are in the centre of Roztocze National Park. This gives us countless opportunities for exploration of one of the Polish natural wonders.One of the must-sees are the half-wild Polish horses (Koniks) around an artificial lake with islands. These descendants of the East-European wild horse have been bred here in Count Zamojski's game reserve since the 18th century. The longer option is to loop through Szczebrzeszyn, a town which contributed to the creation of the most beloved Polish tongue-twister and then a visit to the well maintained synagogue.You can also skip cycling for this one day and arrange a canoe trip along the Wieprz river. We can once again choose between different paths. The shorter route through Kosobudy and other pretty villages, or the Green Velo track in the Wieprz valley. We finally arrive in Zamosc. This city is the cultural and historical highlight of our entire trip and has a wonderful city centre that is a world heritage site. Zamosc was established by Jan Zamojski in the year 1580 and designed by the famous Italian architect Bernardo Morano. It is considered to be the only existing example of a completely Renaissance city both in structure, and layout as well as architecturally. Our last night is spent in a hotel in this historical old town. Day 8 (Saturday): End of the trip and return to Krakow. We depart for Krakow in the morning. The bus will arrive by 2:00 p.m. at the latest so that you can reach your flight, or train, back home from Krakow on the same day. Please do remember to book your additional night with us well in advance in the case that you are planning to return home the next day. The entire tour is over flat or gently undulating terrain. The small climbs are no problem even for less adept cyclists or children. Not included in the price: Travel to Krakow, entry fees, private payments such as other meals, drinks and tips.